North Royalton City Councilman Dan Langshaw is a strong believer in customer service and in the power of constant contact. And, unlike many elected officials, Dan doesn’t wait until campaign season to engage constituents. 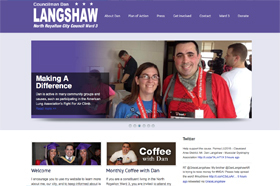 Dan uses his BlueMarker powered website year-round as a way to promote accomplishments and keep residents of Ward 3 up-to-date on the happenings in their community. In addition to the standard campaign contribution page and a yard sign request form, the website integrates Dan’s Facebook and Twitter feeds on every page, providing the visitors with current information on everything from water main breaks to wanted fugitives. Long time residents can learn details about Dan’s monthly constituent coffees, and new residents can quickly request a welcome packet. Dan Langshaw shows that you don’t need to be a candidate for president to have a website with smart, current, relevant content. It speaks to voters because it’s written in his voice and serves the needs of the people who visit it. Best of all, we’ve developed the website so Dan can make quick updates on his own—even from his mobile device.